This is the free town in Copenhagen. There has been a lot of controversy throughout history and it was abandoned in April 2014 during discussion with the Danish government. Now, it's a great place to stroll through, especially during the day, to see how the town is set up, the interesting artwork and buildings. Cannabis is sold and uses freely throughout the town so if you are keen, this place is for you. There are two indoor market and one outdoor market. The indoor ones mainly consist of restaurants, different types of food booths, as well as raw fish and meat. The outdoor market sells primarily flowers, fruits, and veggies. There will be bound to be something to fit everyone's preference here! Also, there are a good number of free samples given out at this market so if you aren't too hungry, this might be a good option. This has a much more international and food truck feel, while the Glass Market is more posh with less varieties. It is very close to Christiana so this would be a great stop after some cannabis or even before or both, what suits you best. You will more than find something delicious to eat here! I can't promise it will be cheap but it's tasty. This is a 17th century tower in the middle of the city that has a panorama view of Copenhagen at the top. Although this is not the best aerial view of a city that I've ever seen, it comes with visiting the museum so it's worth a visit. Included in the price of going up the tower is this museum. People donate an item that reminds them of someone they used to love with a story of that object and how their heart was broken. The items vary from stuffed animals to shoes to cutting boards, you name it. And the stories can be very mild while some a heart wrenching. It was really neat to read into people's lives and a touched by them. The entrance fee is pretty cheap ($3-4) and doing both would take about 45 - 60 minutes. This was one of the better walking tours I've done. My guide was really interactive, informative, and enthusiastic, which made the 2.5 hour walk enjoyable and the cold bearable. It's a great way to learn some history and see a lot of the city. When you think of Copenhagen or see friends post pictures about Copenhagen, I can bet that 97% of it will be of the colorful houses along the waterfront canal. It was originally built as a port but now has become an entertainment and tourist attraction. There are tons of restaurants along the the canal, most are very overpriced, and especially during Christmas time, it's beautifully lit up. Walk up and down the street both during the day and at night to see the difference, it is quite amazing. Although I did not get to visit the museum myself since it's a bit outside of the city, I have heard great things from multiple people. If I had some extra time, I would have definitely gone! If you are into modern art and like seeing something different, this is the place for you. As I mentioned, it's a bit outside of the main city so plan your days accordingly. I normally don't like paying for these tours but I was going with a friend and it seemed cool. Plus it wasn't as expensive as many other things in the city. 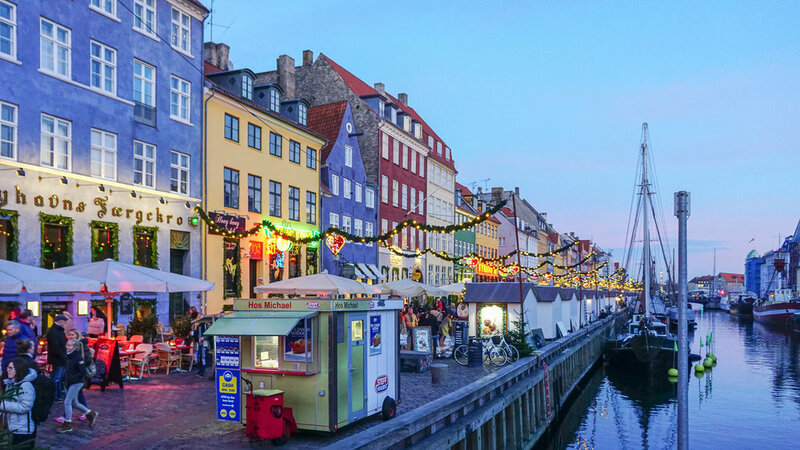 It's about 55 minutes long and you start from the beginning of Nyhavn and make a giant loops around the canal and port of Copenhagen while learning some history about the city. I don't think it was a must do, but definitely different and still interesting. If you have an hour to spare, check it out! I suggest going while the sun is setting so you get to experience a beautiful sunset while on the water. That definitely made the boat tour much more enjoyable! You can buy tickets online or at the box office at the entrance of Nyhavn.